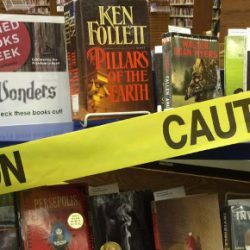 Welcome, everyone, to our Banned Book Week special. Banned Book Week is an annual event every September that aims to raise awareness about censorship and to celebrate the right to read. Many local libraries and bookshops hold events to highlight and discuss the social, political and legal issues around literature. You can find out a lot more at the Banned Book Week website, or at another of my personal favorite websites, the Comic Book Legal Defense Fund, where you’ll find lots of resources including free posters for holding your own event. To celebrate, Cast of Wonders is proud to present Things We Leave Behind, written and narrated by one of our veteran authors, Alex Shvartsman. You’ve heard Alex’s work previously in The Field Trip; You Bet, and our short Christmas tale Nuclear Family. Excellent stories, each. Alex is a writer, editor, and game designer from Brooklyn, NY. Over 60 of his short stories have appeared in Intergalactic Medicine Show, Nature, Daily Science Fiction, Galaxy’s Edge and other venues. He is the editor of the Unidentified Funny Objects anthology series of humorous science fiction and fantasy, which just released its third volume. His short story collection Explaining Cthulhu to Grandma and Other Stories is forthcoming in February 2015. This collection’s title story was recently nominated for the WSFA Small Press Award. You can find Alex on Twitter or online.